The nation will bask in one of the hottest spells of November weather in more than 40 years with the mercury set to nudge 18C (64.4F) in parts this week. However the balmy outlook through the coming days comes with a sting in its tail with a barrage of storms lined up to tear in from the Atlantic. Exposed and coastal western regions are braced for torrential downpours and gales with the east set to dodge the worst of the wind and rain. Low-pressure systems pulled in by a 180mph jet stream will drag a plume of steamy air in from southern Europe where the mercury is currently hitting 23C (73F). Freakishly warm but unsettled weather will hold out until the middle of November as the nation enjoys a late Indian Summer, according to the Met Office. Meteorologist Marco Petagna said: “The main theme for this week will be the very mild temperatures due to a southerly airflow bringing air up from southern Europe. “Parts of Greece are seeing some very high temperatures for the time of year and although we will not get as high, we are in the same flow of air hence the very mild conditions. “This is due to a very active jet stream which is coming out of America at a high speed, it will pull low-pressure systems in from the Atlantic which will drive this southerly air flow but also bring some unsettled conditions. The mercury will rise through the start of the week with southeastern England likely to touch 17C (62.6F) or 18C (64.4F) by Tuesday with double-digit temperatures forecast through until the end of the week. Thermometers will hover widely in double figures with even Scotland and the north likely to lift 12C higher than normal. Western Britain will be in the firing line for bouts of stormy weather through the week with a drier, calmer outlook for the east, Mr Pegagna added. He said: “There will be a bit of a nationwide split through the week with the rain and strong winds out towards the west and the chance of brighter weather towards the east of the UK. “Coastal regions could see gales and there is a chance of some quite heavy and persistent rainfall, but then towards the east of the country it is a different picture with much more settled conditions expected. “The weather is being driven by a powerful jet stream which thanks to high pressure to the east of the UK had become split, and this is helping to pull air up from the south. Thermometers could nudge 18C (64.4F) in parts of the south on Tuesday with warm breezes making it feel close to 20C (68F), according to feel-like temperature charts. Britain could be about to bake in one of the warmest November spells since 1977 when the mercury hit 18.5C (65.5F) in Hereford on the 9th. The temperature record for the 6th is 19.8C (67.64F) which was recorded in Aber, Gwynedd, in Wales, in 1972 with 19.5 (67.1F) measured in Hereford on the same day. Heavy rain could trigger floods in parts of the country although for many the outlook is much calmer compared to last month. Exacta Weather forecaster James Madden said northern and western parts of Britain will be most at risk of stormier conditions. He said: “We are looking at a quieter period of weather compared to the last couple of months and there is the possibility of much milder conditions lasting for a few days through this week. “This is thanks to a southerly airflow which will take control of our weather, however we may see some rainfall in northern and western areas at times. Long-range forecasters agree the warm weather should hold out until the middle of this month before a reversion to more normal conditions. 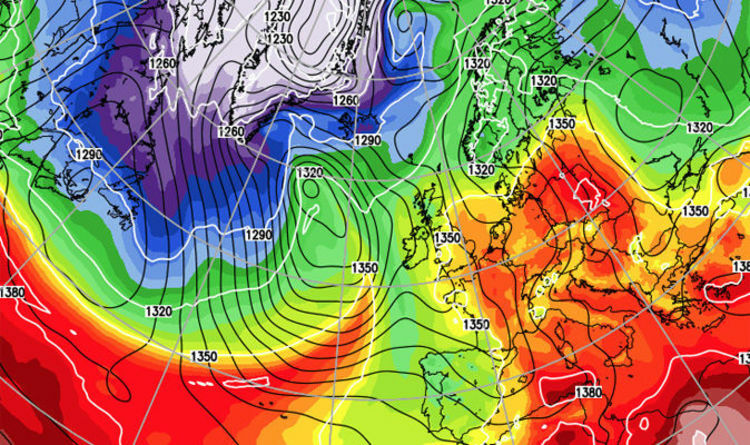 Piers Corbyn, forecaster for WeatherAction, said low pressure close to the tropical Azores Islands, off the coast of Portugal, will help to drive the steam-bath conditions. He said: “It is going to turn largely fine and mild from the start of this week as we see winds come in from a southerly, south-westerly direction. “We are looking at fine, sunny skies mostly although there will be more of a chance of cloud and rain in some southern and western regions. “Low pressure is across the Azores helping to drive this weather and we have a long, meandering jet stream which is also helping to set up this southerly airflow. The Met Office’s 30-day outlook predicts a wet and windy period of weather for some this week with warm sunshine likely elsewhere. It states: “The west will be wet and windy on Tuesday but elsewhere looks drier and very mild in any sunshine. “On Friday and Saturday bands of rain will move from west to east across Britain, interspersed by brighter more showery conditions. “The west and southwest will have the wettest weather, whilst eastern parts see the best brightness. “It will generally be windy at times, with a risk of gales, especially around coasts in the west. While swathes of the UK will enjoy unusually warm and settled weather through the next five days, worrying weather charts show powerful winds lashing the western coasts. Gusts could touch gale-force at the start of the week before topping 70mph bringing driving rain in exposed regions ahead of the weekend. WeatherOnline forecaster Garry Nicholson said: “The south-facing hills of western Britain will receive frequent heavy rain during the week ahead with a risk of localised flooding. “Cornwall and Devon, south Wales, the southern Lake District plus Dumfries and Galloway will be the wettest areas. “Smaller amounts of rain for central and eastern England.